According to Strategiccomm.com (who offers a set of diskettes for Apple Macintosh and IBM-compatible computers, providing examples of effective charts and conceptual visuals at a cost of $49.95 plus shipping and handling), "the real workhorse of most presentations is the chart or graph that shows relationships among variables; this form enables the audience to grasp complex data at a glance." As senior editor of the world's foremost bolg about wanting to go to the zoo with Phillies ace pitcher Roy Halladay (visit us online at zoowithroy.com), I agree with these industry experts. 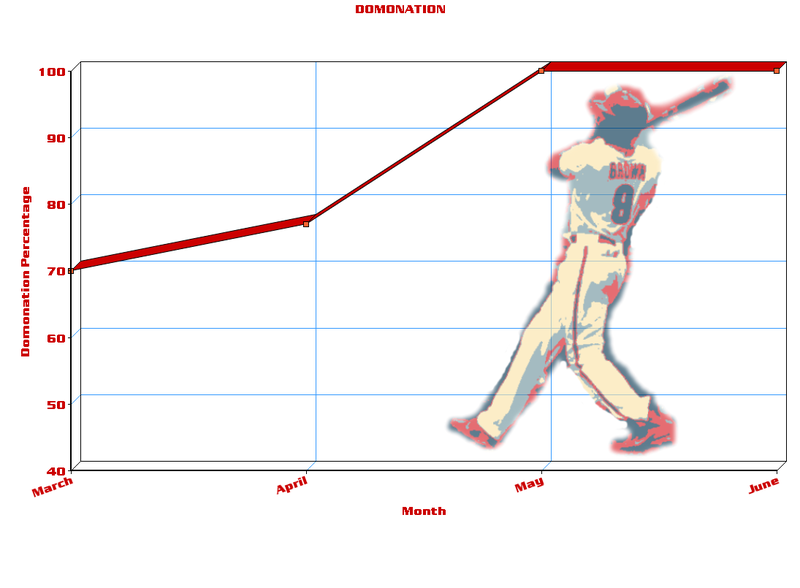 Fittingly, I made a chart that represents just how much Domonic Brown has been Domonating ™so far this 2013 season. I imagine that Judith Stein, co-author of Presentations for Decision Makers, would agree that I didn't overload it unnecessarily and hinder the message.